It's not just about ray tracing - there are big frame-rate increases. Nvidia has released first benchmarks for the GeForce RTX 2080, based on its new Turing architecture. The company's numbers suggest that the new card delivers circa 2x the performance of the last-gen GTX 1080 on certain games. Much of this remarkable gen-on-gen leap is derived via new Nvidia technology called DLSS - deep learning super-sampling. The same benchmarks running without the technique in play, along with titles not supporting DLSS, show performance increases more along the lines of 30 to 50 per cent, with select titles posting even higher increases. The move to release benchmarks comes in the wake of Nvidia's presentation on Monday evening, where CEO Jen-Hsun Huang's presentation concentrated almost exclusively on the ray-tracing and deep-learning capabilities of the new range of GPUs, with only the most oblique references to standard 3D performance. Releasing these benchmarks can be seen as an attempt to reassure users that the power of the ray tracing hardware and the deep learning AI Tensor cores comes in addition to the big leap in performance, not instead of it. Four of the benchmarks specify that the performance gain is with the title running under HDR, the implication being that the boost may not be quite as pronounced running in standard SDR, but it is the DLSS numbers that are likely to raise eyebrows as the boost to performance is so profound. At an Nvidia press event hosted by the firm today, we saw a demonstration of the technology in action, with the Unreal Engine 4 Infiltrator demo running at 4K resolution side-by-side on systems using GTX 1080 Ti and RTX 2080 Ti. A frame-rate counter was active on both, showing the Pascal card running at around 35 frames per second, with the RTX 2080 Ti delivering twice the performance level across the entire demo - which does seem to confirm Nvidia's claims. It's important to stress that DLSS does not work on all games but for those that do support it, the key question concerns image quality. In its demo, Nvidia compares DLSS to standard UE4 temporal anti-aliasing. Based on the subjective eyeballing of three DF staff members, we'd say that based on the Infiltrator demo at least, Nvidia gets pretty close in achieving comparable quality here. Close-up head-to-heads revealed a minuscule amount of shimmer on the DLSS side but overall, the demo was rather impressive. That said, full judgement will need to be reserved for actual games where the dynamic, ever-changing nature of any given title may prove more challenging to process effectively. Nvidia has shared some of its own internal performance benchmarks. There's not much detail on settings, beyond the fact we're looking at 4K resolution comparisons between RTX 2080 and the last-gen GTX 1080. 10 8 6 1.21 1? 78T 60T 45T 12T? 8T? Benchmark numbers for the RTX 2070 and the top-tier RTX 2080 Ti have not been revealed, but the RTX 2080 numbers - assuming they stack up, of course - do highlight that we are looking at a very different, new and improved GPU architecture that can't be assessed on core count alone [UPDATE: Article updated with fuller descriptions of the gains). There has been some concern about standard 3D performance as we should expect an RTX 2080 to outperform the older generation GTX 1080 Ti, yet the new card has significantly fewer CUDA cores - 2944 vs 3584. However, the benchmark numbers Nvidia has shared suggest that the RTX 2080 should still have a performance advantage over GTX 1080 Ti despite this, and the additional CUDA cores should see a further substantial leap delivered by the top-tier RTX 2080 Ti. Meanwhile, Nvidia has also revealed new enhancements to its Ansel tool for the GeForce Experience - which allows users to create stunning super-high resolution screenshots via a debug camera, with further customisation options available including bespoke filters. Ansel RTX brings the new GPU architectural features into the mix. For example, games supporting ray tracing can see the effect ramped up to significantly higher levels. Nvidia demonstrated this with the forthcoming Asseto Corsa Competizione, where Ansel RTX screenshots benefit from a 10x improvement in per-pixel refractions, a 12x boost to ambient occlusion samples, a 32x uptick in shadow samples and a 40x boost to reflection samples. On the AI side of things, Ansel's standard technique of delivering super-resolution screenshots via tiling has been supplemented with an AI upscaling mode that can deliver 8K shots. 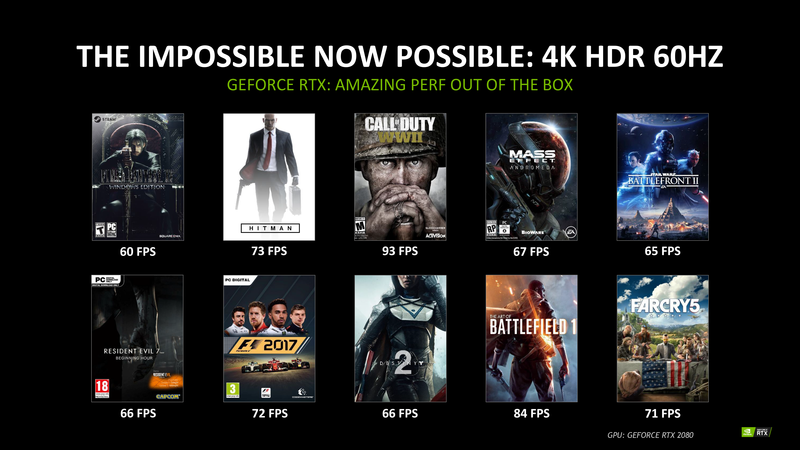 Returning to performance matters, Nvidia has also shared a second slide revealing that key titles such as Far Cry 5, Destiny 2, Final Fantasy 15 and Resident Evil 7 offer frame-rates in excess of 60fps at 4K resolution on RTX 2080, with Battlefield 1 and Call of Duty WW2 delivering the best results of the bunch at 84fps and 93fps respectively. Unfortunately, quality presets for these numbers haven't been shared, but it's another way of Nvidia telling us that the arrival of ray tracing and deep learning features doesn't mean that standard 3D performance has been overlooked. We'll bring you our own performance numbers and analysis closer to the release date of the new hardware. Nvidia invited Digital Foundry to its reveal event and Editor's Day press event, paying for travel and accommodation.